After winning the Hometowner Award for best local feature at last week's Indie Memphis Film Festival — along with a slew of other jury citations — Morgan Jon Fox and John Tom Roemer's OMG/HaHaHa gets a week-long run at Studio on the Square. 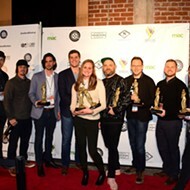 Fox is no stranger to Memphis filmmaking, having previously won the top local prize at Indie Memphis for his debut, Blue Citrus Hearts, but OMG/HaHaHa marks a serious step forward for the filmmaker, something hinted at by the "special recognition" citation the film garnered from this year's Indie Memphis narrative-feature jury. Visually and tonally, OMG/HaHaHa is inspired by films such as Harmony Korine's Gummo and Gus Van Sant's Elephant. The Gummo connection comes through strongly. If you can't stomach Korine's film, you might struggle here. If you think Gummo is beautiful, as I do, the best parts of OMG/HaHaHa are likely to be quite moving. Where Blue Citrus Hearts was relatively conventional in following two teen protagonists through a coming-out drama, OMG/HaHaHa dispenses with standard narrative. It's a series of often acutely observed moments from the often messy lives of a group of interlocking characters. The arc of the film is more emotional than narrative, though the film is given a web-culture framing device to pull its various strands together. The tender, compassionate tone is familiar from Fox's other work. Visually, the most memorable moment might be the afternoon coupling of a couple of post-high-school guys who fell in love in geometry class and are taking their relationship into adulthood. Screenings of OMG/HaHaHa will be preceded by a trailer for Craig Brewer's upcoming web series $5 Cover, for which Fox served as assistant director.